Fredric Jameson (born 14 April 1934) is an American literary critic and Marxist political theorist. Adorno retains the concept of the system and even makes it, as target and object of critique, the very center of his own anti-systematic thinking. ... His most powerful philosophical and aesthetic interventions are all implacable monitory reminders—sometimes in well-nigh Weberian or Foucauldian tones—of our imprisonment within system, the forgetfulness or repression of which binds us all the more strongly to it. Unless that situation - which as vanished into the past - is somehow mentally restored, the painting will remain an inert object, a reified end product impossible to grasp as a symbolic act in its own right, as praxis and as production. 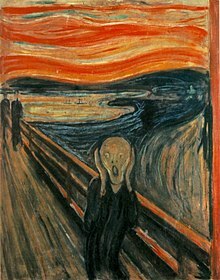 Edward Munch's painting The Scream is, of course, a canonical expression of the great modernist thematics of alienation, anomie, solitude, social fragmentation, and isolation, a virtually programmatic emblem of what used to be called the age of anxiety. The moderns were interested in what was likely to come of such changes and their general tendency: they thought about the thing itself, substantively, in utopian or essential fashion. Postmodernism is what you have when the modernization process is complete and nature is gone for good. It is a more fully human world than the older one, but one in which "culture" has become a veritable "second nature." Postmodernism theory is one of those attempts: the effort to take the temperature of the age without instruments and in a situation in which we are not even sure there is so coherent a thing as an "age,"or zeitgeist or "system" or "current situation"any longer. Postmodernism theory is then dialectical at least insofar as it has the wit to seize on that very uncertainty as its first clue and to hold to its Ariadne's thread on its way through what may not turn out to be a labyrinth at all, but a gulag or perhaps a shopping mall. This matter of periodization is not , however, altogether alien to the signals given off by the expression "late capitalism," which is by now clearly identified as a kind of leftist logo which is ideologically and politically booby-trapped, so that the very act of using it constitutes tacit agreement about a whole range of essentially Marxian social and economic propositions the other side may be far from wanting to endorse. Capitalist was itself always a funny word in this sense: just using the word - otherwise a neutral enough designation for an economic social system on whose properties all sides agree - seemed to position you in a vaguely critical suspicious, if not outright socialist stance: only committed right wing ideologues and full-throated apologists also use it with the same relish. What "late" generally conveys is rather the sense that something has changed, that things are different, that we have gone through a transformation of the life world which is somehow decisive but incomparable with the older convulsions of modernization and industrialization, less perceptible and dramatic, somehow, but more permanent precisely because more thoroughgoing and all-pervasive. The success story of the word postmodernism demands to be written, no doubt in best-seller format; such lexical neoevents, in which the coinage of a neologism has all the reality impact of a corporate merger, are among the novelties of media society which require not merely study but the establishment of a whole new media-lexicological subdiscipline. Utopia is a spatial matter that might be thought to know potential change in fortunes in so spatialized a culture as the postmodern; but if this last is a dehistoricized and dehistorizing as I some times claim here, the synaptic chain that might lead the Utopian impulse to expression becomes harder to localize. Utopian representations knew an extraordinarily revival in the 1960's; if postmodernism is the substitute for the sixties and the compensation for their political failure, the question of Utopia would seem to be a crucial test of what is left of our capacity to imagine change at all. The last few years have been marked by an inverted millenarianism in which premonition of the future, catastrophic or redemptive, have been replaced by senses of the end of this or that (the end of ideology, art, or social class; the "crisis" of Leninism, social democracy, or the welfare state, etc., etc.,); taken together, all of these perhaps constitute what is increasing called postmodernism. If the ideas of a ruling class were once the dominant (or hegemonic) ideology of bourgeois society, the advanced capitalist countries today are now a field of stylistic and discursive heterogeneity without norm. Faceless masters continue to inflect the economic strategies which constrain our existence, but they no longer need to impose their speech (or are henceforth unable to); and the postliteracy of the late capitalist world reflects not only the absence of any great collective project but also the unavailability of the older national language itself. Theories of the postmodern - whether celebratory or couched in the language of moral revulsion and denunciation - bear a strong family resemblance to all those more ambitious sociological generalizations which, at much the same time, bring us the news of the arrival and inauguration of a whole new type of society, most famously baptized "postindustrial society"(Daniel Bell) but often also designated consumer society, media society, information society, electronic society, or high tech and the like. Such theories have the obvious ideological mission of demonstrating, to their own relief, that the new social formation in question no longer obeys the laws of classical capitalism, namely, the primacy of industrial production and the omnipresence of class struggle. If we are unable to unify the past, present, and future of the sentence, then we are similarly unable to unify the past, present, and future of our own biographical experience or psychic life. Fruit trees in this world are ancient and exhausted sticks coming out of poor soil; the people of the village are worn down to their skulls, caricatures of some ultimate grotesque typology of basic human feature types. How is it, then, that in Van Gogh such things as apple trees explode into a hallucinatory surface of color, while his village stereotypes are suddenly and garishly overlaid with hues of red and green? The problem of postmodernism - how its fundamental characteristics are to be described, whether it even exists in the first place, whether the very concept is of any use, or is, on the contrary, a mystification - this problem is a t one and the same time an aesthetic and political one. It would seem essential to distinguish the emergent forms of a new commercial culture - beginning with advertisements and spreading on to formal packaging of all kinds, from products to buildings, and not excluding artistic commodities such as television shows (the "logo") and best-sellers and films - from the older kinds of folk and genuinely "popular" culture which flourished when the older social classes of a peasantry and an urban artisanat still existed and which, from the mid-nineteenth century on, has gradually been colonized and extinguished by commodification and the market system. It seems to be easier for us today to imagine the thoroughgoing deterioration of the earth and of nature than the breakdown of late capitalism; perhaps that is due to some weakness in our imaginations.